Unselfconscious and quietly compelling, Charles Gill’s nuanced abstract paintings invite the viewer’s contemplation. The Idaho-based artist is fascinated by the subtlety of the mundane—closely observing quotidian acts such as shelving towels, mowing the lawn, or cleaning the garage and likening them to the process of building a painting one stroke, blot, and smear after another. His intimately scaled series “chips” originated from color samples he applied to index cards. As the samples accrued over time, he began to consider them aesthetically, arranging them in compositions. 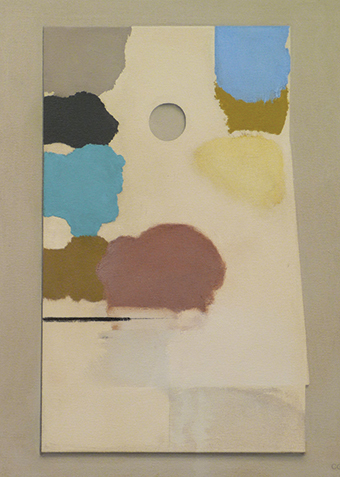 The resulting paintings maintain close ties to second-generation Abstract Expressionist artists including Helen Frankenthaler and Kenneth Noland, although the paintings’ unassuming scale, eclectic use of frame, and trompe l’oeil passages place them firmly within a postmodern context. APEX is an ongoing series of exhibitions of Northwest-based artists, curated by Bonnie Laing-Malcolmson, The Arlene and Harold Schnitzer Curator of Northwest Art. Supported in part by the Arlene and Harold Schnitzer Endowments for Northwest Arts and the Paul G. Allen Family Foundation.